The TDX6 is an advanced design six-point temperature scanner and pyrometer. It continually scans up to six thermocouples and sequentially displays the thermocouple number and its reading. Each sensor input has a field settable trip point for alarm, shutdown or control. A read/scan selector allows the operator to set and view each trip point. With the selector in the scan mode, a thermocouple read push button provides a means to manually toggle through the six channels and to lock in on a specific channel. Normal scanning will resume approximately three seconds after releasing the push button. All trip points are continually armed and active during the scanning process. 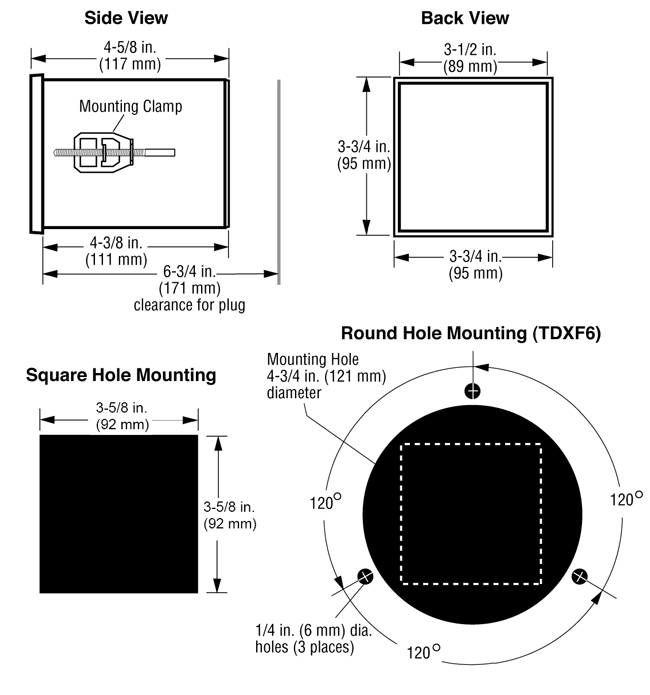 Type J or K, grounded‡ or ungrounded thermocouples are accommodated. Other types are available upon request. The TDX6 can interface with other Murphy Selectronic® Tattletale® annunciators and microcontrollers. It is rated for Class I, Division 2, Group D, hazardous areas* and is available for operation from CD ignition, 120 VAC or 24 VDC. NOTE: Using grounded thermocouples introduces the risk of odd currents or voltages being imposed on the thermocouple signal which can affect the accuracy of the reading. 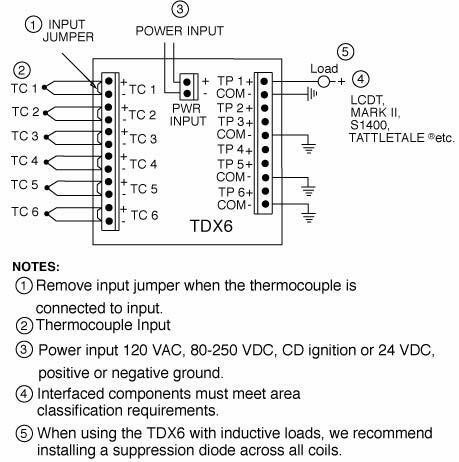 This is an inherent problem of grounded thermocouples and the reason why we prefer ungrounded thermocouples. Models TDX6-A and TDX6-C: Six isolated Silicon Controlled Rectifier (S.C.R.) outputs; 0.5 A @ 250 VDC; switches on (applies ground) above trip point and switches off (removes ground) when power is switched off. Models TDX6-B and TDX6-D: Six isolated Field-Effect Transistor (F.E.T.) outputs; 0.1 A @ 250 VDC; switches on (applies ground) above trip point and switches off (removes ground) below trip point. Start-up Time Delay: Unit is locked out for 10 seconds after ignition voltage is sensed. Open Thermocouple Input: A number 1 appears in the display to the right of the channel number and the trip point operates.